SMALL but capable. That's the ethos behind the new Jeep Renegade. Despite sitting on the same platform to be used by the upcoming Fiat 500X, Jeep says the new Renegade will have ample off-road ability. In fact, Jeep has promised to deliver best-in-class off-road capability, open-air freedom and convenience as well as a segment-first nine-speed automatic transmission. The Renegade isn't expected to reach Australia until late 2015 - about 12 months longer than the Europeans and Americans who will be the first to see it in showrooms. Early indications are that it will be available in four specifications - Sport, Longitude, Limited and Trailhawk - powered by a selection of three four-cylinder petrol engine ranging from 1.4 litres to 2.4 litres. A diesel is expected to be available, but whether the oil-burner makes it to Australia is to be decided. "The all-new 2015 Jeep Renegade expands the brand's product portfolio and targets the rapidly expanding small SUV segment around the globe with benchmark levels of efficiency and driving dynamics, while at the same time delivering best-in-class 4x4 capability that customers expect from Jeep," said Jeep's president and CEO Mike Manley. 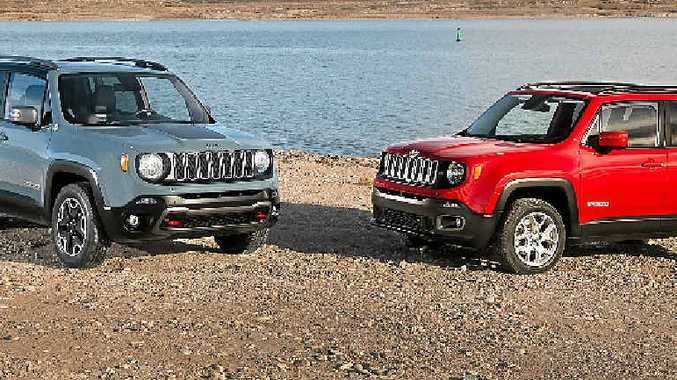 "Renegade symbolises the brand's renowned American design, ingenuity and innovation, marking the Jeep brand's first entry into the small SUV segment in more than 100 markets around the globe."